What? My Dad said I have about a half-hour to finish this post. My Dad has a soccer match to officiate in Grayslake this morning…something about an AYSO coach who needs to be monitored, who needs to be enlightened. So, we will be leaving about 10:30, the key word being “WE.” I get to go bye-bye in the Scion xB this morning! The weather has cooled down, so I am getting more car rides. My rough coat is fully grown out, the last cut was back in April, so I am ready for any kind of weather. 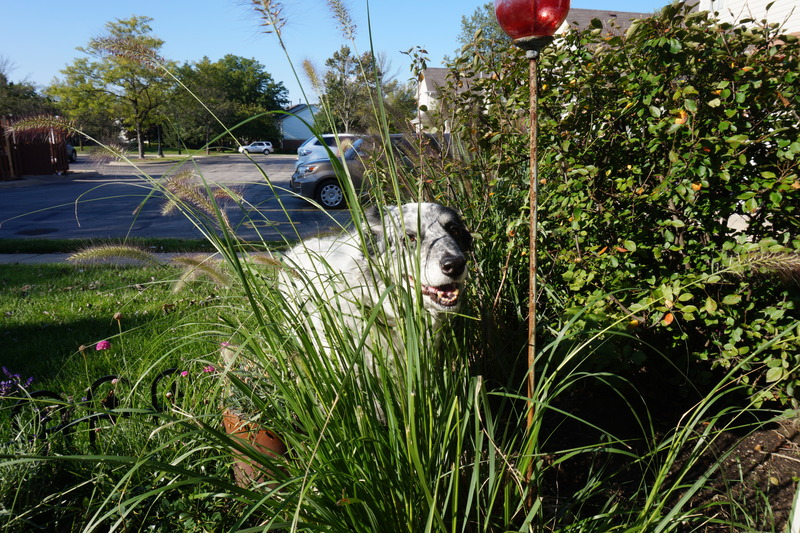 When I am out on walks with My Dad, I really enjoy eating grass…not just any grass, not from cut lawns, but from the long ornamental grasses and the wild grasses that are uncut. I eat this grass because it tastes good – not because it makes me throw-up. But as long as we’re on that topic of throwing-up, let me tell you about re-cycling a BusyBone (registered trademark) that My Dad had given me last week. My Dad has noticed that when I consume a BusyBone, I can usually finish one off in about five to six minutes. My Dad keeps telling me that BusyBones are to be savored, they’re supposed to last several hours. Well, I can enjoy a BusyBone very quickly. My loyal followers are aware that I have a large throat and when I am eating, a lot of chewing is not necessary. So BusyBones can be compared to a thick branch, and my rear teeth can be compare to pruning shears. The BusyBone is snipped into 3/4 inch segments and swallowed whole. But sometimes this can cause (My Dad refers to it as) gastro-intestinal distress. I am very good about waking My Dad up if I have a “let’s go out NOW” emergency. But last week, My Dad had given me a BusyBone that he had placed in hot water for about 10 minutes, to soften it up a bit. But, unbeknownst to My Dad, I had swallowed a piece of BusyBone that was about three inches long, and later that day, My Dad saw me throw-up on the carpet, and guess what was part of that material? Yes, the three inch section of BusyBone. Stop making faces! This is when a BusyBone is at it’s best…soft, sort of fermented, a bit more chewy. I had that mess cleaned up in about five minutes. My Dad even said, “Good boy, Cody.” Go figure. So, remember the gorgeous, beautiful, wonderful Brandy? Yes, our neighbor’s black female, the tall, lanky one, gorgeous golden brown eyes…blah, blah, blah. So My Dad, the wizard that he is, has been walking her and then BRINGING HER OVER HERE thinking that I am going to entertain her. Think again. Sure, a couple of times she walks over to me, gets in the LETS PLAY position and then starts running around my place like a crazy female. She soon realized that she was not my type, I just look away…boring, so boring. 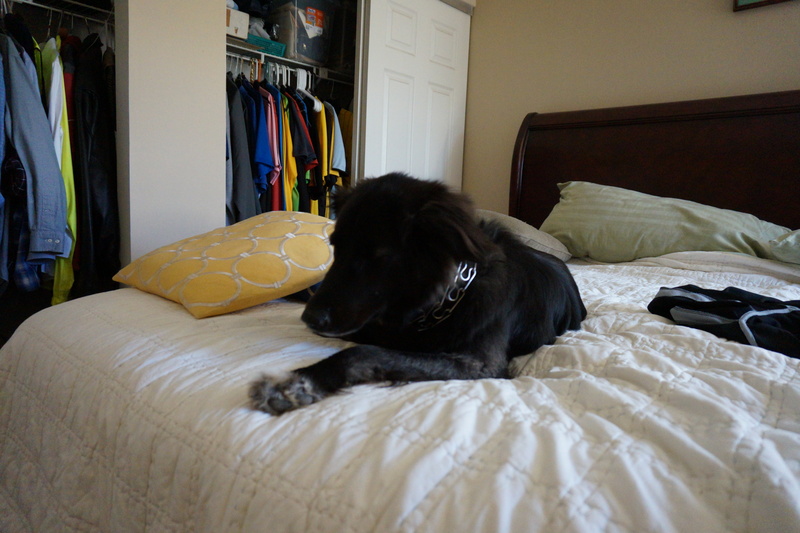 Then, Brandy figures out on the second day that it is OK to sleep on My Dad’s king-size bed. Yeah, perfect, just make yourself at home. 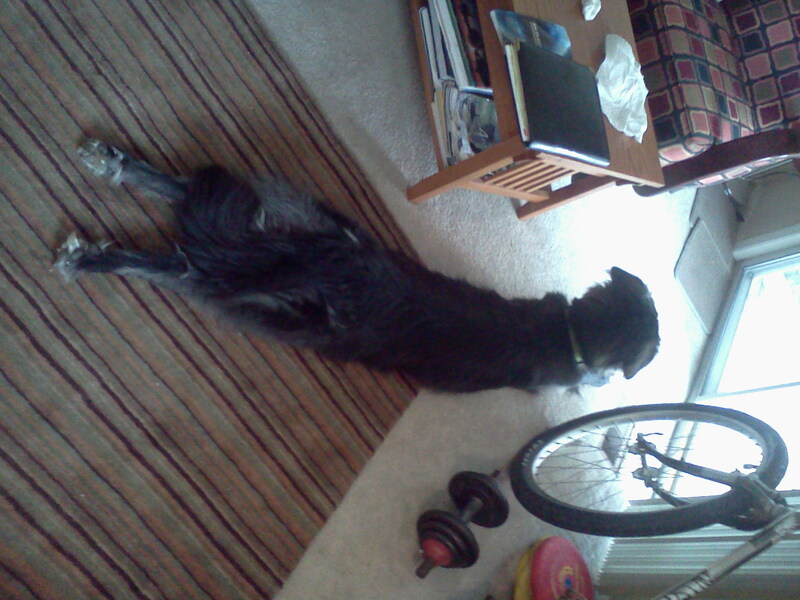 Oh, yeah, Brandy’s nickname is “stretch.” Weird position. What? OK. Gotta go, soon! My Dad took me a park last Saturday morning. I got to say HI! to a bunch of people who were running some sort of Walk-Run for a Literacy Group – people who mentor and tutor those who have trouble reading. Mmm…maybe I can get in on that activity, I have some experience with children reading to me. What? OK, gotta go. Later. 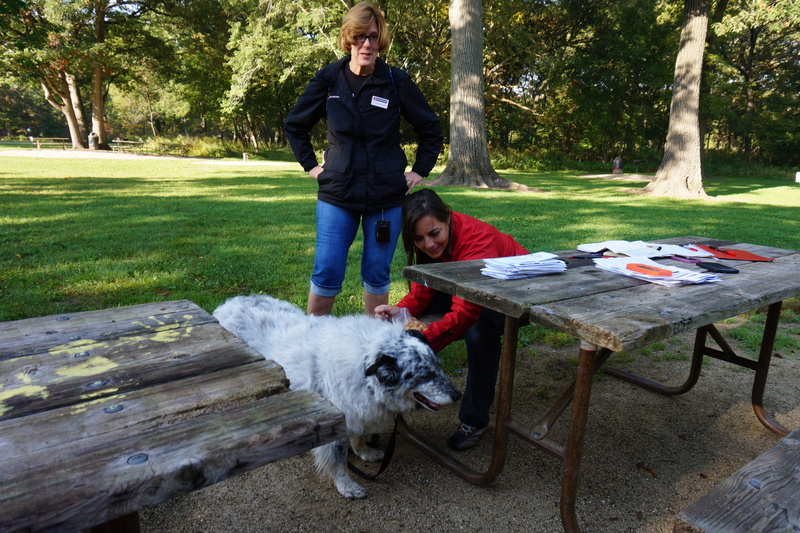 This entry was tagged border collie, dog, dog behavior, dogs, dogs and people. Bookmark the permalink. Oh Cody you do make me chuckle sometimes. 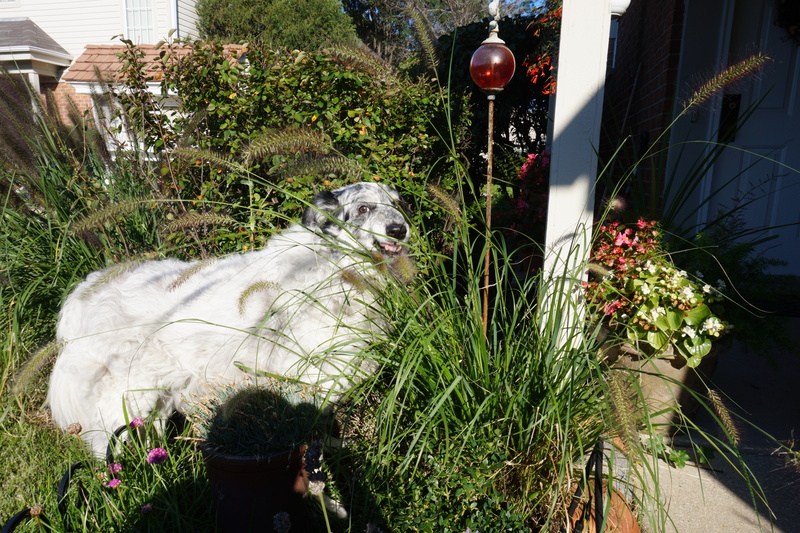 Molly likes eating grass too. Well, she likes eating everything really and has been known to swallow whole socks (the thin trainer liner type). I never actually see her take them or eat them, I only discover what’s she’s done when they come out the other end (ewww). Not good eh?